From the various studies and research done by the east as well as the west, we know that drinking Green Tea is beneficial to our bodies. Besides drinking it, have you ever thought of using the Green Tea leaves or powder as a beauty remedy? Here are 7 tips on how to get extra mileage after drinking a cup or two of Green Tea. 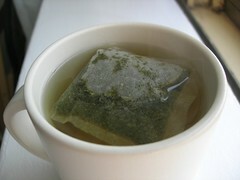 After steeping the Green Tea with hot water, put aside a little of the tea before sitting down to enjoy the rest of it. Mix the liquid with baking soda instead of water into a paste You have just created a homemade toothpaste that has a little breath freshening flavor! Use the Green Tea liquid as a mouthwash as it has anti-bacterial properties instead of the regular mouthwash which may contain alcohol. If you have sensitive or irritated skin, take a used Green Tea bag which has cooled and make a compress to help reduce the redness. It can also be used on cuts, scrapes, burns and puffy eyes, too. Green Tea powder can be purchased from health food stores or online. Add to your favorite smoothie, or homemade green tea ice cream. Green Tea powder can be used as a mask and it acts as amoiturizing mask for dry skin. Just mash up half a banana, add one tbsp of honey, one tbsp plain yogurt and one tsp green tea powder. Medical studies found that Green Tea is equally effective in treating acne as benzoyl peroxide but without causing dryness, itchiness or irritation of the skin which can result from using benzoyl peroxide. By applying a Green Tea cream directly to the infected area can actually reduce inflammation and provide a variety of benefits as an antioxidant. To make the treatment even more effective, drink one to two cups of Green Tea daily or take a Green Tea supplement. You can find Green Tea, supplements and creams online, health food store or your local grocery. 1. Brewing the Green Tea and freeze it into ice cubes. 3. Rub the cube gently in circular motion on your face until it melts away. Do not rinse. 5. Apply some moisturizer and your usual sunblock. My next topic for discussion is, "How often should you get a facial?" 68) What Are The Natural food Containing Collagen? 69) Top Ten Vitamin C Superfood. 73) Health Benefits of Green Tea. Thank you for looking and taking the time to read my blog. I welcome feedback and feel free to share your experience in relation to this topic. Thse all home made tips are very useful. Thank you so much. Green tea is my favourite one.But i don't know Green tea is one of the beauty tips. After I read this blog. I feel happy.I will follow this beauty tips. thank you so much. This tips are very useful Thank you so much. Useful article. Thank you so much. This website is very useful to me. Thanks for sharing. Home made tips are very natural and will have rare side effects. It is better than cosmetics which contains harmful chemicals. Thanks for the tips.